Sure-Life Laboratories is proud to announce distribution has begun for our new livewell treatment for bass and walleye ... CATCH AND RELEASE®. 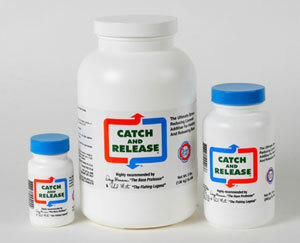 The new CATCH AND RELEASE® formula contains a revolutionary tranquilizer that has a pleasant smell and is totally safe for humans and fish. Please contact us for more information. Sure-Life Laboratories will still continue to produce and distribute PLEASE RELEASE ME™. Tournament anglers will now have another choice when it comes to the care and live release of bass and walleye. Sure-Life is the evolution of live release formulas. Testing CATCH AND RELEASE® … Doug Hannon keeps an 8 pound bass alive in a 1/3 full tank at 86 degrees without aeration for 3 hours, using nothing but CATCH AND RELEASE® and hydrogen peroxide. We do not recommend keeping livewells at 86 degrees. This was done for testing purposes only. Optimum livewell water temperatures for holding bass range from 60 to 75 degrees Fahrenheit. For Walleye, gradually cool water by 10 degrees Fahrenheit. 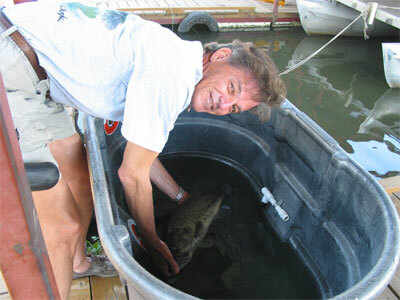 This bass was released healthy back in to Lake Fork following the experiment.